Tribe Tattoo Edinburgh started life in a small shop on West Nicolson St in the city’s Southside in 1999 near the university. Before long we were bursting at the seams but were reluctant to give up our spot on such a great wee street, surrounded by alternative shops, great snack bars and of course just opposite the Pear Tree pub and beer garden. We decided we needed another tattoo studio in Edinburgh, and the only other street with the same alternative buzz at the time was Cockburn St, off the Royal Mile- historically the most famous stretch of counter culture in Scotland- so we set up shop there. Sadly, Cockburn Street has lost its ‘cool’ and is now mostly tourist shop orientated, so we went on the move again……we found a beautiful studio on Broughton Street, which we had for nearly 10 years. As much as we loved being part of the Broughton Street village, having our team split into two camps had its challenges, and we felt we would prefer to all work together in one big studio, so when, in 2016, we got a chance to rent a large shop just opposite our original, small space on West Nicolson St, we jumped on it! Now we are next to the Pear Tree pub, instead of opposite it, and our old shop now belongs to Deadhead comics, a small independent comic shop with a cult following. A worthy successor to our beloved studio! 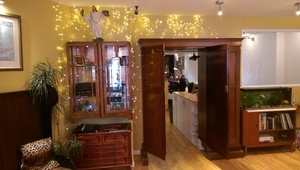 Tribe Tattoo Edinburgh is the friendly and warm studio in Edinburgh's University area, with work spaces for 6 artists, laser technicians and George the piercer. The studio offers tattooing body piercing (including dermals), laser tattoo removal and cosmetic tattooing in a diverse range of styles. We specialise in custom tattooing, but we also offer any style of flash designs. Our international award-winning artists all have their specialties and favourite styles, so if you are looking for something special we are bound to have the artist for you. If you are looking for your first piece of ink or are working on completing a back piece, we cover all styles, from small symbols to large tribal designs, from simple script to Japanese sleeves and everything in between. By Bus: Catch any bus going south from the huge bridge that goes over Waverley station (North Bridge). Get off outside Lidl , W. Nicolson Street is the next on the right. By Train: Get off at Waverley Station and catch the bus from South Bridge. By Car: From the east end of Princes Street turn up the Bridges and keep going south for 15 mins. West Nicolson Street is on your right. A few doors down from the Pear Tree pub. We also offer a premier body-piercing service, laser tattoo removal, cosmetic tattooing, body jewellery and other merchandise. If you are looking for body piercing in Edinburgh, our piercer George provides an experienced, swift and professional service, including dermals. It will be over before you know it, and you will be sporting a beautiful new piece of jewellery, safe in the knowledge that we are on hand for any aftercare advice or jewellery changes later on. If you find yourself regretting ink you’ve had done when you were ‘young and stupid’ (we’ve all been there!) or just need a small piece out of the way to make room for something larger, we can help. Our modern laser can remove or just lighten your old tattoo, leaving you to move on or enjoy your new project, depending on what your plans are. We can help with advice on what works best for your new project, just book a free consultation and/ or test patch and we can give you our professional opinion, based on years of experience with both laser and tattooing. Call us to book a no obligation, free consultation, we can help you with any project you may be planning! Both of our studios operate under the strictest hygiene regulations, are registered and inspected regularly by the Environmental Health and are licenced. We regularly work with the media to promote safe tattooing and piercing practices, and to provide information in general about a still much misunderstood art form. We want you to enjoy yourself when you come to see us, so whether you are after tattoo removal, a new piercing or some original ink, our team go above and beyond to make sure your experience at Tribe Edinburgh Tattoo is relaxing and memorable.